Segment is an analytics tool that aggregate all of the data about your customers in one place. Use this solution to minimize dependencies on your website and make tracking easier. We've created a method that lets you send data from LiveSession to Segment. 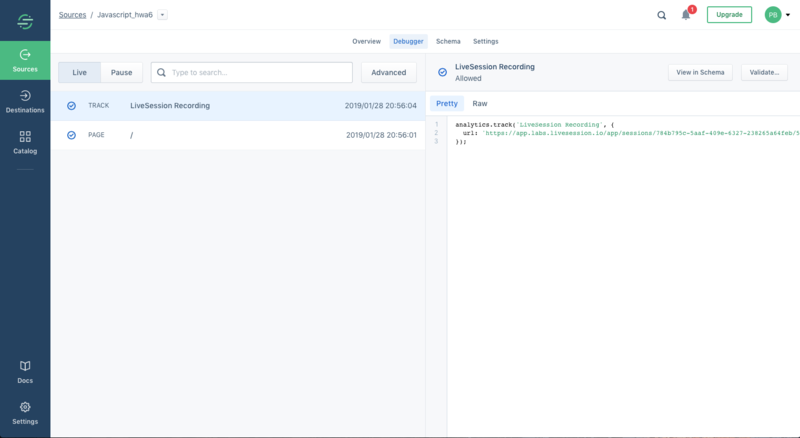 This integration lets you add links to session replays from LiveSession to your Segment analytics as an event. As the result, you can transfer this data to other analytics tools and store it with rest of information about your users. Every time a new session will start, our code will send an event to Segment with a link to session replay. To make this integration works you need to have Segment (analytics.js) and LiveSession installed on your website. If you haven't installed our tracking code yet check this article. To see if you installed LiveSession integrations correctly on your website open your Segment debugger and find LiveSession Recording. It should contain link to recorded session.